Black Cloud by Patricia Hermes. A Horse Diaries Book. Review: It's every little girls dream to own their own pony, but what about to be a pony? Take a wild adventure as you read the hardships and ways of life of a wild mustang. If you are a horse lover or ever dreamed of owning a pony then this is the book for you. The endless action and different points of view will keep you flipping the pages until the end. This is the 8th book in the series as well. Horse Diaries: Black Cloud, written by Patricia Hermes acknowledges the prospective of the less thought of. The main character is a young, wild mustang given the name of Black Cloud. 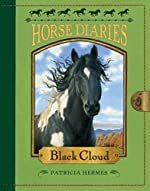 Horse Diaries: Black Cloud, informs you of his way of life and lifelong lessons that horses in the wild must learn. When humans take over the heard and threatens his entire herd, Black Cloud must summon all of his bravery to make a new life and forget the past. His points of view will make humans realize that wild horses and other animals have thoughts and feelings just as they do. If Black Cloud has the courage to face humans then surely he will have the courage to rejoin the wild. The Horse Diaries series will keep the readers leaping from one book to another. These books are great for children over seven years old but this one is very realistic. I would read with caution seeing as how there is an amount of violence. But, they let children step into the hooves of horses and feel their experiences. These books can be educational and a very entertaining for young children. Like the other books in this series, Black Cloud will send your emotions from joy and fulfillment to weeping with sadness. The stories of horses' lives have never really been accounted for with great enthusiasm until now. Patricia Hermes will send your heart and mind racing through the wind as Black Cloud runs for his life. We would like to thank Random House for providing a copy of Black Cloud for this review. Have you read Black Cloud? How would you rate it?